You could excuse bank executives for being a little perplexed by their investors. JPMorgan Chase & Co., Citigroup Inc. and Wells Fargo & Co. all reported earnings on Friday morning that largely beat expectations. But shares of all three slumped soon after the market opened. For the past few years, those executives have been spinning the same story. Yes, our revenue and profit growth has been slow, but just wait until interest rates pick up. Then everything will really take off. It’s not us. It’s interest rates (and the Federal Reserve). Investors appeared to have bought in. Shares of banks are up 90 percent in the past five years. Investors have particularly taken to the big banks this year, thinking that tax cuts, a robust stock market and generally good business vibes — broadly defined as the Trump Bump — would pay off as more consumers and businesses increased borrowing. JPMorgan’s shares now trade at 1.7 times their book value, which seems to indicate investors expect high returns. Most of the big banks’ stocks traded for less than their book value after the financial crisis. Now interest rates are rising and the money should be rolling in. But the story isn’t playing out like the bank executives said it would, and investors are taking notice. The banks don’t seem to be getting the benefit from higher interest rates that investors once imagined they would. Yes, interest income rose more than 10 percent in the quarter for JPMorgan and Citigroup, but interest expenses were up in the 50 percent range. Investors can point to three reasons for disappointment. The first is loan growth, or rather the lack of it. Low unemployment and a continued rising economy and stock market, especially in an expansion as long as this one, should produce a surge of lending. The tax cut was supposed to amplify that jump. Instead, lending at the largest bank, JPMorgan, rose just 0.2 percent in the first quarter from the previous three months. Wells Fargo’s loans dropped by 1 percent, though some of that can be attributed to the bank’s particular problems. 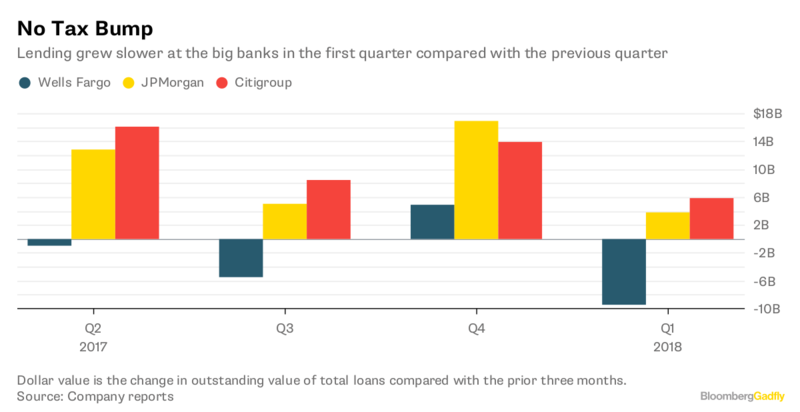 Citigroup’s lending was up 1 percent, but that stemmed largely from a push to expand its credit card business, which hasn’t been going so well. In the first quarter, the bank had to increase its provision for losses in it retail-branded cards by 16 percent. Yes, analysts were predicting that lending would be relatively weak, but it was even weaker than many forecast. Second, higher interest rates were supposed to translate into much higher lending profits. That isn’t the case, either. Part of the explanation is that long-term interest rates haven’t risen as much as short ones, compressing the lending profit spread. But banks also appear unable to hold onto as much of the benefit of higher short-term rates as expected. They have had to pass along some to consumers, who are their lenders. Net interest margins, which used to be in the 5 percent range, are still stuck in the 3 percent range. Third, higher interest rates were also supposed to lead to more profits in the buying and selling of bonds, which used to be a chief driver of the big banks’ profits. Volatility was up in the first quarter, and many expected that would translate into big trading profits. But it didn’t, at least on the bond-trading side. Equity trading was a bright spot, but that’s never been a big profit center. The higher-interest-rates-equal-higher-profits story was flawed from the beginning. Interest rates were historically low and stayed that way for so long that many individuals and companies took advantage of the low rates and refinanced. Many companies seemed to borrow more than they needed. Now that interest rates are rising, there’s no great demand for borrowing. The banks’ mortgage businesses weakened during the quarter. Bank investors’ patience is running out.